I know quite a few knitters and crocheters who love gaming! 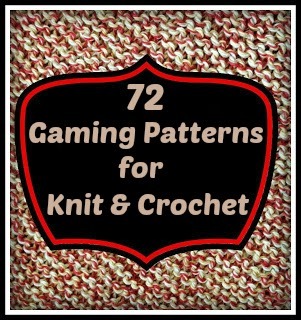 So I thought why not find patterns from around the internet for those that love knitting, crocheting, and gaming as much as I do! Please note that my criteria for this was that they must be FREE. I found many other cool gaming ones that were not free patterns but they are not included here. We tried to think of as many games as we could to share with you, and search for the patterns. If you know of any that aren't included here, send us a link to the pattern and we will add it to the next round up! Disclosure: Some of the links in this post are affiliate links. As an Amazon associate, I earn from qualifying purchases. 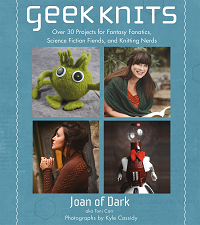 Looking for some more geeky knitting inspiration? Check these out! Thirty fun geeky knitting projects; Cthullu fingerless gloves a Sherlock Holmes style Baker Street Hat, a Star Trek Themed "Communicator Purse", Tom Barker's infamous Doctor Who scarf in sock format, a tardis patterned "Blue Box Scarf", and much more. 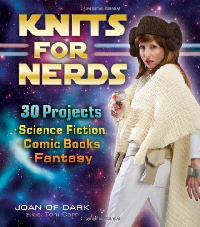 Thirty nifty nerdy knitting patterns, including hobbit feet slippers, a space princess hat complete with iconic buns, "Aim to Misbehave" jacket (this coat is of course brown), manga robot mecha legwarmers, the classic time traveller scarf, a Gryffindor themed book bag, and more. What a great list! Thank you for sharing these, love the tetris blanket! A great collection of games. I agree with you anymore. Also great blog here with all of the valuable information you have. Keep up the good work you are doing here. Thank you for sharing such a useful post. here's a really good plants vs zombies knitting pattern i found on ravelry. it includes a pea shooter/snow pea and a sunflower. Thank you I added this!